Reducing the fat content in your favorite entrée is possible and easy to do. There are several low- or reduced-fat versions available of the traditionally high-fat foods. For example, instead of using a large quantity of mild cheese such as mozzarella, try a low-fat cheddar variety with more taste per mouthful and less fat. Milk, sour cream and several other reduced-fat foods can be substituted in most recipes without altering the taste or texture. 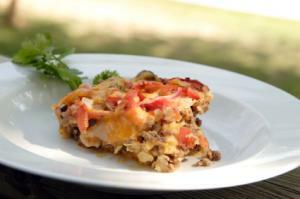 These recipes are both low-fat and nutritious. Enjoy! Preheat oven to 400 degrees. Prepare penne according to package. Cut leeks into 2" lengths and quarter lengthwise. Rinse completely to remove sand particles. Place leeks and bell pepper in a 13" x 9" baking dish. Add broth, lemon juice, 2 tsp. of oil, thyme and black pepper. Cover with foil and roast for 15 minutes. Add squash, olives and salmon to baking dish and drizzle with remaining 1 tsp. of oil. Cover and return to oven for 30 minutes or until salmon is opaque and vegetables are tender. Place the penne in a large serving bowl. 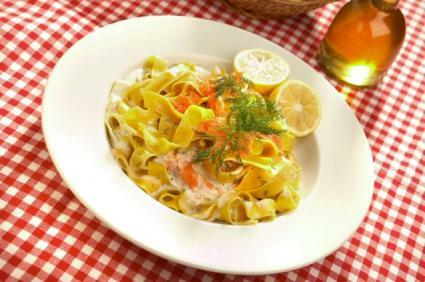 Break up salmon into bite-size pieces and add to penne with the vegetables. Preheat oven to 350 degrees. Spray a 13" x 9" baking dish with cooking spray. Line the bottom of dish with 10 tortilla halves. Layer tortillas with chicken, corn, onion, bell pepper and then stewed tomatoes. Cover with remaining tortillas; pour diced tomatoes on and sprinkle with minced chilies. Cover with foil and bake about 30 minutes or until heated through. Remove from oven, uncover and sprinkle with shredded cheese. Return to oven for 10 minutes or until cheese is melted. Season the tenderloin with salt, pepper, and herbs. Place tenderloin in a slow cooker, pouring jam, 1/4 cup of honey and 3 tbs. of wine over the top. Cook on low for four to five hours. About 15 minutes before serving, heat 2 tbs. honey or agave, 1/2 cup of wine, and blackberries in a saucepan. Simmer for about 15 minutes, until the sauce thickens. Slice the pork and spoon sauce over the top. Makes six servings, with 417 calories each and 3.4 g of fat. Saute onion in oil until transparent. Add garlic and cook until the garlic just releases its scent. In a saucepan, combine quinoa, broth, cumin, cayenne, salt, and pepper. Bring to a boil and reduce to a simmer. Simmer for 20 minutes. Add corn and simmer an additional five minutes. Add black beans, onions, and garlic. Heat to warm. Stir in cilantro. Serve. Serves 10. Each serving contains 142 calories, 1.7 g of fat and no cholesterol. Choosing lean meats such as skinless chicken breasts, ground turkey and fish instead of fatty beef cuts and other dark meats can substantially lower the fat in your main dish. When using beef, it is best to select a tip or top cut as these are the lowest in saturated fat. Using small amounts of oil in a recipe is beneficial to keeping fat content low. If fat is called for in a dish, try replacing some of the oil with low fat chicken broth.